The Moody 64 INDEPENDENCE OF HERM is a great yacht for families, who want a relaxed sailing vacation with a friendly and experienced crew liking kids. Lots of water toys available. 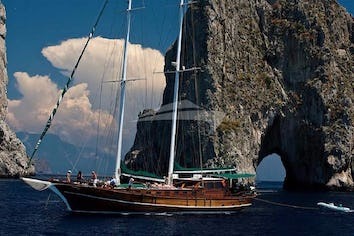 The yacht is well maintained, permanently upgraded, and in excellent condition. The Moody flagship is, in every way a magnificent vessel. She is the ideal centre cockpit ocean-going yacht in which to undertake the most ambitious blue water cruising. 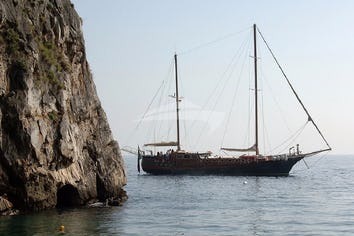 INDEPENDENCE OF HERM is also a powerful sail boat, capable of fast passage times across a full range of conditions. This performance derives from Bill Dixon’s hull shape which balances the power of the underwater sections and lead keel with the tall, high aspect ratio, hydraulically powered fully furling cutter rig with self-tacking staysail. Despite her size two persons easily handle the Moody flagship. Sail controls and deck handling systems are powered and controlled from the cockpit with its twin steering wheels, padded helm seats and integrated instrument and engine consoles. 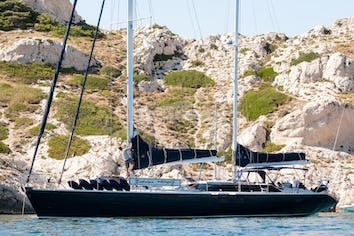 Whilst the standard Moody specification is surprisingly high - including: bow-thruster, hydraulic opening transom, electric winches, Navtec hydraulic rams to backstay & vang, plus Hood sails - mainsail, yankee and staysail – SWEET ALMA has even more…… Electronics and domestic equipment also come largely as standard, including: radar, chart-plotter, 2 x flat screen TV’s, DVD and hi-fi system! Internally this yacht is finished in teak and the accommodation is magnificent with a particularly large raised saloon. This fully exploits the entire width of the generous hull shape and, with its large side and forward facing windows, has high levels of natural light and superb visibility. The massive owner’s stateroom aft has a large double bed, seats, ample lockers and full en-suite facilities. The adjoining study area, aft of the nav station, is complete with foldaway sea-berth. There are two guest cabins forward, one with double berth and the other with upper and lower berths, each with toilet and shower compartments. In the bow is a captain cabin with its own facilities (and built in optional washer / dryer). The galley is to starboard aft of the saloon built in a U shape for practical use at sea – it is fitted with the upgraded Force 10 cooker, a fridge, deep-freeze plus the optional dishwasher. Juan was born 1977 in Argentina and grew up in Spain. After achieving various degrees in Agro – and Marine Technology he turned his passion of the water into a career. He started professional sailing in 1995 and sailed in all these years a great number of different vessels as Captain in nearly all areas of the world. He has also a lot of experience in yacht racing, sail training and diving. Juan speaks Spanish, English, Portuguese and Italian fluently and has basic knowledge of French. He is known as a warm and professional Captain; when onboard the guests feel safe and well informed. It is his aim to give his guests the best times. Besides sailing, Juan loves high mountain climbing and Yoga. Christine was born 1973 in France and grown up around boats and water. Her professional career on yachts started when she met Juan. Before she was working in high class hospitality service and also as architectural photographer for different companies and objects. During this time she facedsome of the most demanding customers with calmness, energy, respect and efficiency. Smiles and devotion are the most obvious aspects of Christine’s delightful personality. Christine speaks French and English fluently. It’s her aim to make the guests holidays an unforgettable experience.